To perform the urethrovesical anastomosis, the right-medial port IV (for the needle holder) and the left lateral port I (for endo-dissector or second needle holder) are used to achieve an optimal angle between the instruments (30-35 degrees). During this part, we insert the bougie for optimal exposure of the urethra. 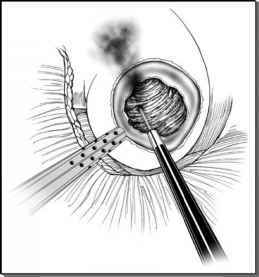 If it is necessary, the bladder is retracted cranially by a grasper inserted via left medial port. We start with a 17-cm suture at 6 o'clock taking the posterior urethra together with the rectourethralis muscle (Fig. 12). The telescope is inserted deep in the pelvis with the 30-degree angle looking upward. Subsequently, two further stitches are made at 5 and 3 o'clock followed by two stitches at 7 and 9 o'clock starting with the bladder side and then the urethral side. All stitches are performed using intracorporeal knotting technique and tension-free stitches. Thus, all sutures are tied outside the urethral lumen. Choreographed sequence and hand positions are summarized in Table 4.